The Manhattan Solid Waste Advisory Board (MSWAB) is a volunteer citizens’ advisory board dedicated to helping NYC achieve its zero waste goals. The Board meets monthly, and meetings are open to the public. Pharmaceutical recycling has arrived to NY State, click here to find a drop off near you! NYC has banned polystyrene (styrofoam!) What does this mean? Beginning January 1, 2019 certain expanded polystyrene (EPS, popularly known as “styrofoam”) products will be banned from sale, distribution, or use in NYC. Materials covered by the ban include EPS single-service items including cups, bowls, plates, takeout containers and trays; as well as EPS loose fill “packing peanuts”. Visit nyc.gov/foamban for more information, and read the MSWAB’s writeup here. FREE training program for NYC apartment building maintenance staff (two 8-hour sessions). 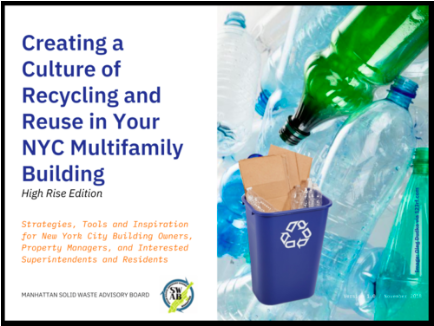 Learn how to improve your recycling set-up, how to get residents to recycle, how to avoid fines, and more! Have you witnessed recycling violations and/or contamination? Use the MSWAB’s NYC Recycling Violation Form to submit photos and comments. The MSWAB will compile violations and share them with the NYC Business Integrity Commission for followup action. Applications for the 2019 Composting Grant are now closed! Citizens Committee for New York City, the Manhattan Solid Waste Advisory Board (SWAB), and Manhattan Borough President Gale Brewer have partnered to offer grants to start, expand, and grow composting programs in all five boroughs of New York City.